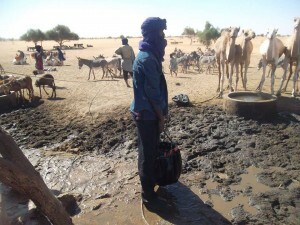 We mainly operate in the region of Kidal in Azawad (northern Mali) and more precisely on the site of Ingagael, 180 km South-East of the city of Kidal. Ingagael is located in the Azdjarat valley, surrounded by mountains on the East and dunes on the West. Ingagael is located on the road between Menaka and Kidal. 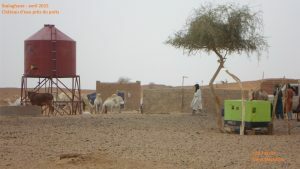 A water well is present on location, but badly maintained. Facilitating the access to basic health care. Promoting education and professional guidance as well as facilitating access to education and offering logistical support. Participating in the elementary right to water and electricity, as well as investigating on possible agriculture or other cultures. Active promotion of the Tuareg culture within the local community as well as worldwide promotion. Offering support in the defense of the basic human rights of the Tuareg population by organizing sensibility campaigns on their current situation on national and international level. Construction of a cereal bank to provide sufficient food supply at all times. End of 2014, Takrist co-financed the purchase of a water tower in Ibalaghane (see accomplishments 2014 below). A few months after the installation of the water tower, the women of the village used the water supply of the water tower and took the initiative to create a small garden near the well. They planted some vegetables, such as tomatoes and onions. To see pictures of the garden at its beginning, click here. Afterwards the women organized themselves to create the Women’s Association of Ibalaghane in order to enlarge the garden and thus create themselves a work opportunity and also participate in the emancipation of the women. 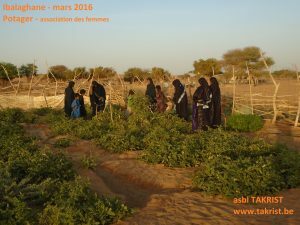 End 2015, Takrist supported this initiative with a financial donation to the Fund of the Women’s Association in order to buy seeds such as tomatoes, peppers, carrots, potato, salad, beets and onions giving the women a boost to start their gardening activity. For pictures, click here. During the month of November 2014, Takrist was contacted by populations of Ibalaghane to assist in the installation of a water tower. After one year of existence, in which we mainly focused on fundraising, and with the help of various individual donations, we were in the ability to respond positively to this request. The water tower was purchased in Kidal and had to be transported on a crane truck to Ibalaghane Kidal, about 180 km away over sand tracks. Once arrived, welders and technicians were responsible for the implementation. Late December, we got the good news that the water tower was in place and functional. The water tower consists of a water reservoir with a capacity of 70 barrels (or 14,000 liters) and is connected to an existing water well that works by means of a fuel pump. Having a water tower is not only a water reserve, but more importantly it allows better management of the water. There is less water waste and savings are especially made on the use of the fuel pump. We have been looking forward to this first project which is mainly based on cooperation and co-financing with the local population and this especially during a period of unrest in the region. We thank all those who helped us in one way or another, directly or indirectly, with this initiative. To view more pictures of this first project, click here.